Happy Halloween! Get ready! The Snowflake Showcase Limited Release Product Suite is coming TOMORROW! Starting November 1st, 2018, 5 All-New Products will be available for purchase through November 30th or While Supplies Last! Cut a piece of Call Me Clover Cardstock to 4 1/8″ x 5 3/8″. Adhere with Snail Adhesive. Cut a piece of Shimmery White Cardstock to 4″ x 5 1/4″. Stamp the tree from the Snow is Glistening Stamp Set in Versamark Ink. Cover with Call Me Clover Embossing Powder. Set with a Heat Tool. Smooch with Call Me Clover Ink. (Smooching Tutorial Here) Flick splashes of color with a Call Me Clover Stampin’ Write Marker. Wrap a piece of Call Me Clover 1/8″ Grosgrain Ribbon as shown. Adhere to the card with Stampin’ Dimensionals. Zip a piece of Cherry Cobbler Cardstock through the Big Shot with the large and 2 small snowflake dies from the Snowfall Thinlits. Snip the large snowflake in half. Adhere one half to the top of the ribbon (Snail Adhesive). Cut the other half to fit the corner. Adhere with Snail Adhesive. Adhere the two small snowflakes with Mini Glue Dots. Stamp the sentiment in Versamark Ink onto a piece of Shimmery White Cardstock. Cover with Call Me Clover Embossing Powder and set with a Heat Tool. Trim to size and flag the end with the Banner Triple Punch. Adhere with Stampin’ Dimensionals. Add Rhinestone Basic Jewels to the snowflakes, sentiment, and card as shown. Color with the Dark Call Me Clover Stampin’ Blends. 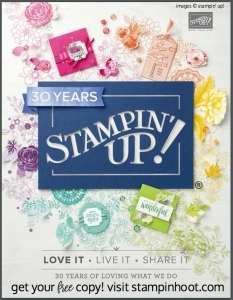 Have you tried the 2018-2020 In-Color Stampin’ Emboss Powders? It is worth the investment, the colors are so vibrant and glisten beautifully. The Call Me Clover is perfect for a Christmas green, don’t you think? What an amazing suite of products the Snowflake Showcase is! So many beautiful images and dies for all occasions. Remember, this is a limited release and only available until November 30th or while supplies last. TODAY IS THE LAST DAY TO EARN A TAKE YOUR PICK TOOL as FREE HOOT LOOT with a purchase over $50! Also, today is the last day to take advantage of my Exclusive October Newsletter Special! You can read about it here: NEWSLETTER SPECIAL! This downloadable tutorial is not the same as shown in the picture using the Call Me Clover. It shows using Sea Foam and completely different card. It is such a lovely card. Thank you for sharing your great ideas.